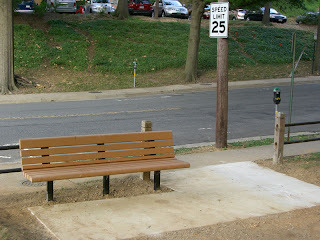 Two new park benches have been installed at Ft. Myer Heights park. One, which is wheelchair-accessible, I hope to be able to use a half-century from now. Steve Campbell put together the proposal for these and other park improvements. A big thanks to Steve for his contribution to the neighborhood.